Pond Algae and How to Control Algae? Algae forms in a pond when sunlight reacts with nutrients in the water. These nutrients are comprised of primarily Ammonia and Nitrate which you may recognize as the ingredients in fertilizer. These nutrients result from the breakdown of debris such as leaves, grass, and other windblown organic matter as well as from fish waste and uneaten fish food. As these items decompose the nutrients become the food for algae in many forms including string algae that covers rocks and clings to the surface of your pond as well as the usual green water also called pea soup effect. There are several ways to control your pond water and keep it crystal clear. Each have benefits and certain drawbacks and are detailed below. A liquid or powder algaecide is the fastest way to clear up your pond but also the fastest way to kill your fish and pond plants. A liquid or dry algaecide will chemically destroy algae but is done so with harsh chemicals and compounds that are being increasingly monitored or banned by certain states and municipalities. With an algaecide you can expect to see an overnight improvement but it comes at a price. The algaecide will be very hard on any plants you have in the pond. Additionally the oxygen supply in the water will plummet. When algae are alive they are living breathing plants that actually add oxygen to the pond water. Upon death it rapidly consumes all the available oxygen in the pond. If you intend to use an algaecide please read the directions carefully as an overdose can quickly harm or kill your plants and fish. 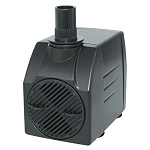 When using an algaecide you will also want to increase circulation in your pond with a waterfall, fountain or aerator. These will replace lost oxygen and hopefully prevent a fish kill. Finally it should be noted that the dead algae will fall to the bottom of the pond and form the food for the next generation of algae. A UV filter / UV Sterilizer is often used to clear up green water quickly in a pond. These items are both the same thing and differ only by how fast the water flows thru them. A UV filter is a device that allows water to be pumped thru it and bombards that water with Ultra Violet radiation from a bulb. The slower the water travels thru the unit the longer the water stays in contact with the bulb and the more UV rays are absorbed. These UV rays sterilize the algae and it quickly dies. Use of a UV filter can clear green water in just a few days. Unfortunately UV filters only cover up the water quality problem. While they clear the green water the underlying problem that caused it to begin with remains. Often the algae will come back in another form such as string algae which clings to the surface area of your rocks and pond liner. This algae does not pass thru the UV filter so it is never treated and continues to thrive off the nutrients in the pond and the dead algae. If you need to quickly clear the pond water a UV is great but it should be used in conjunction with other treatments to eliminate the nutrients in the water and establish a natural balance in your pond. Barley straw or liquid barley extract is a natural way to keep your pond clear. Barley straw bales have been used by farmers for hundreds of years as a type of natural algaecide but in reality it does not actually kill or remove the algae. Barley added to the pond will begin to degrade and break down. As the barley decomposes it releases enzymes that will slightly change the PH of the pond water. This change in PH provides the pond with a habitat that is less suitable to the growth of algae. Use of the barley extract or barley bales is most effective before a pond has an algae problem. Both the bale and the liquid extract need to be retreated frequently so that the pond continues to have a new supply of degrading barely. Many people find this method very effective while others fail to achieve the results they hoped for. I believe this method is best used in conjunction with a pond bacteria product as part of a multi pronged approach to clear water. 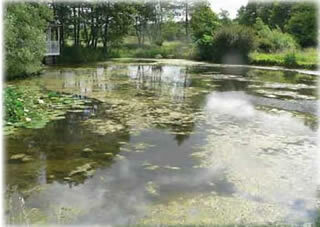 Liquid or powdered pond bacteria is another popular way to establish a healthy naturally clear pond. Bacillus bacteria is found in all natural ponds and is part of natures way of keeping a healthy water cycle. Bacillus bacteria is a natural garbage disposal for your pond. As the colonies of bacillus bacteria grow they feed on the very same nutrients that algae like to feed on. The bacillus bacteria will begin to consume decaying plant matter and fish waste and will continue to eat and multiply for 12-16 weeks. The regular use of a pond bacteria will ensure that continual new colonies of bacteria will emerge and scrub the pond clean of the nutrients that algae require to grow. If algae does not have a food supply then it cannot thrive. Like the barley treatment, use of pond bacteria will require a bit of patience as the colonies take 2-6 weeks to grow and mature. This is a long term solution that should be considered as one of the best possible preventative measures to keeping a clean and healthy pond. If you use a UV filter you will want to use the pond bacteria to help consume the dead algae and to reduce the nutrients in the water. If you use a chemical algaecide you would want to follow with a large dose of pond bacteria to consume the dead algae before the next cycle begins. If you use a barley extract you will want to consider adding the pond bacteria to reduce the nutrients that feed the algae. If you use a debris scrub on the surface areas of your pond then follow with treatments of bacteria to your pond. The bacteria will attach itself to any surface area in the pond and is invisible. However, if you add bio media such as bio balls into the waterfall filter of your pond that media will house large colonies of beneficial bacteria and will scrub the water as it passes over. 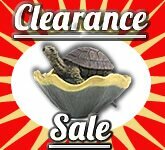 Special winter note: During the falls leaves and other debris will accumulate on the bottom of your pond. Use a winter blend bacteria or a super concentrate and treat thru the winter. The bacteria will continue to consume debris thru the winter and will allow your spring startup to be more problem free. Other algae reducing tips will help control algae in your pond and will help make any of the above treatments more effective. Do not over feed your fish. Goldfish and Koi typically do not require daily feeding. Some customers tell us that they feed their fish 2-3 times a day. The more fish waste the more nutrients in the pond for algae to consume. Feeding fish should be done no more than once a day and they should be given no more food than they can consume in 2-3 minutes. In a pond with full algae bloom I would not feed the fish at all until it is under control. The fish will be happy eating the algae itself and it is probably better for them that the regular fish food. NOTE: Once the temp of the pond water falls below 50 degrees do not feed the fish at all as their system cannot properly digest it and you can harm or kill the fish. Do not overstock your pond with fish. A general rule of thumb is 1 inch of fish per 100 gallons of water in your pond. That is probably a very conservative estimate but if you have a 400 gallon pond stocked with 20-30 goldfish or koi that are 1-3 inches long you are going to require a considerable amount of filtration and treatments to handle that kind of fish load. Final note: Pond maintenance should be a simple quick routine done on a weekly or bi weekly basis. The use of the proper items to care for your pond will ensure a safe and happy home for your pond plants and fish and will give you more time to enjoy your pond instead of working on it. Graystone Industries and its web sites offer many pond water care items which may be viewed at http://www.graystonecreations.com/ . At this time we do not offer any chemical algaecide products as we firmly believe that the harm to the fish and plants in the pond outweigh the benefit of killing the algae. We do carry UV lights, bacteria, barley extract and other effective and safe pond water treatments.